What’s The Best Litter Box for Senior Cats? Elderly cats have special needs, almost by definition. They need special food and more veterinary attention. Many older cats also need you to adjust their litter box for them and make it more comfortable and accessible. We set out to find what’s the best litter box for senior cats and put together this extensive guide for you. Read to see why your senior cat may need a new litter box and which one you should choose to help him or her make the most of their golden years. According to the American Association of Feline Practitioners, a cat is considered to be a Senior from ages 11 to 14. After that, they are considered to be geriatric. It’s at this point in a cat’s life that they will start showing some signs of aging. Since cats are great at hiding their pain, you may not notice problems right away. For that reason, you should begin taking your cat in for regular check-ups every 6 months at this time so your vet can keep an eye on things. One of the problems that you may notice with your aging cat is that they stop using the litter box as often as they should or even altogether. As annoying as this may be to you, finding the best litter box for senior cats will help you and your cat enjoy their golden years. What Special Needs Do Senior Cats Have When It Comes to the Litter Box? There are a few reasons that your senior cat may have difficulty using the litter box. It’s important to note that you should always rule out acute medical problems with your vet such as bladder infections before assuming that it’s simply old age causing the problem. Once your vet has cleared your cat, then you can consider one of these possible problems. Your cat may not show it, but they could have arthritis. Cats are prey animals as well as predators, and one of their adaptations is not showing signs of weakness. In the wild, predators go after weak-looking animals, so cats don’t show their pain even in the safety of your home. A recent study done in Japan found that more than 90% of cats over the age of 11 have signs of arthritis showing up on x-rays. Many of these cats were not showing any outward signs of pain, but the x-rays revealed that they were, in fact, suffering from arthritis. If you have a high-sided litter box or the litter box is in a place that is difficult for the cat to reach, they may stop using it simply because it’s painful for them. For that reason, the best litter boxes for senior cats are ones that are easy to get to and easy to get in and out of. Just like humans, cats can get dementia as they age. Officially known as cognitive dysfunction, this problem may show up in older cats more often than people realize. Because owners may not recognize the signs of cognitive dysfunction, it may go undiagnosed. When a cat becomes confused, one of the things they do is go to the bathroom outside of their litter box. Although it’s impossible to know for sure, they may simply be confused as to where the litter box is, think they are in the litter box, or forget entirely that they’re supposed to use the litter box. Another common problem that affects senior cats is loss of bladder control. This is due to the fact that the muscles which control their bladder become weak, leading to accidents. If this is the problem, then getting the best litter box for senior cats will help your cat get to their litter box quickly and easily. In some cases, a lack of bladder control could have a medical problem behind it other than aging, so you should always take your cat to the vet first to rule out bladder infections, bladder stones, and other problems that can cause urinary incontinence in cats. There are a few things that you need to look for when searching for the best litter box for senior cats. Following these criteria will help your aging feline get to where they need to be when they need to be there. Because so many senior cats have problems with arthritis, it’s important to provide them with a litter box that allows them to easily step in and out of it. If they have to jump to get into their box, they’re likely to avoid that pain and find another place to go. 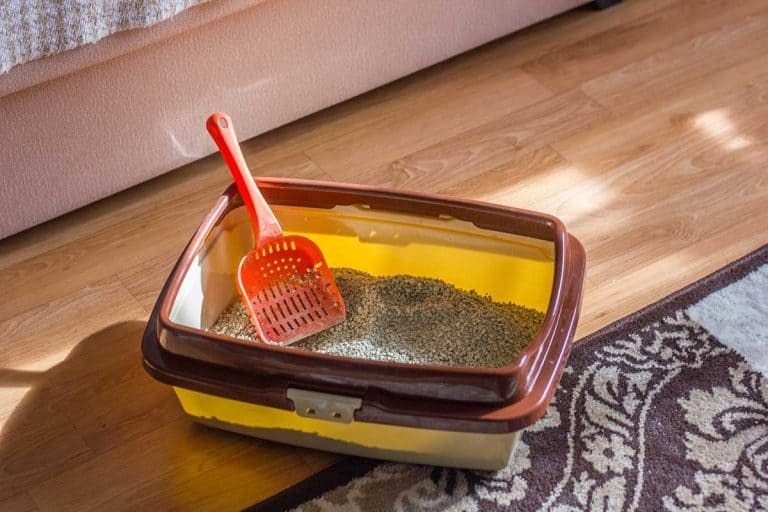 If you’re worried about litter being scattered everywhere, look for a litter box that has one low entry point and high sides along the other walls. This will minimize scattered litter. 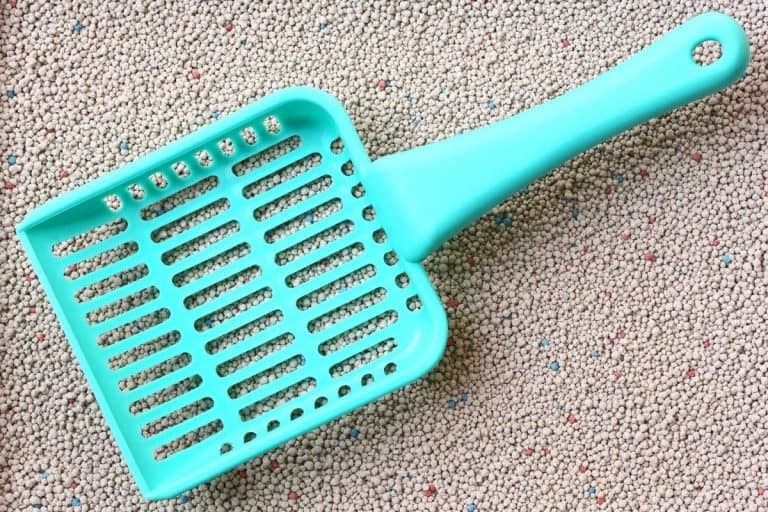 You can also place a mat in front of the litter box that will catch stray bits of litter so they don’t end up all over your house. Along the same lines are the top entry litter boxes. 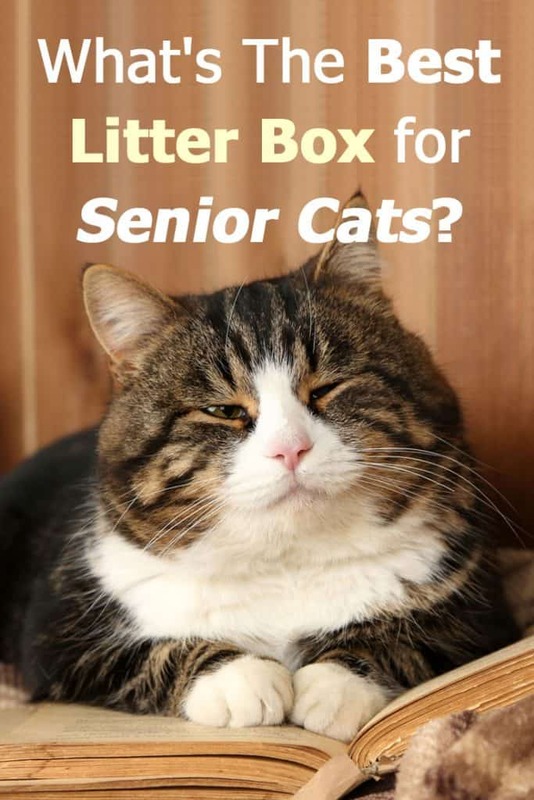 Despite their popularity, these litter boxes are not the best litter box for senior cats. They force the cat to jump up, then down just to get into the box, and then up and down again to leave. 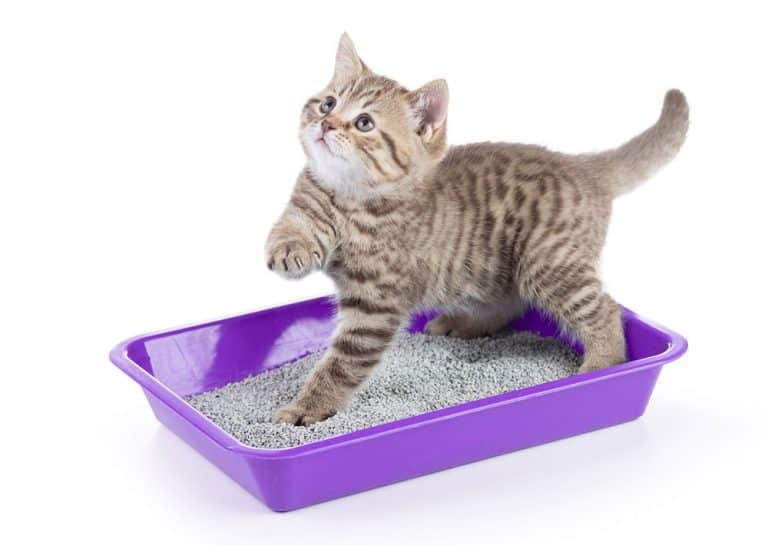 These can also be difficult for a cat to get into quickly if they are experiencing urinary incontinence, so allowing them to simply step into their litter box could help them make it in time to avoid making a mess on the floor. Fortunately, there are a number of litter boxes to choose from besides these top-entry boxes that will provide your cat with the privacy they need but will still allow them to get in and out easily. If dementia is the root of the problem, your cat will do significantly better with a box that they can see. This may serve as a reminder to go when they need to go. It also makes it easier for them to smell when they’re looking for a place to go. Cats that have always used a covered litter box may not do well with a sudden change to an open litter box, so you may need to find one that’s covered but has a low opening without a door to help them find their way. You may consider switching your feline friend to a covered litter box if you have to move their box to a location that’s easier for them to get to. If it’s in a high-traffic area of the house, they may appreciate having a little privacy. These are some examples of the best litter boxes for senior cats. If you don’t choose one from our list, be sure to choose a similar one since these meet all the necessary criteria for senior cats. This certainly is a better box when it comes to senior cats. It’s made with a high-quality plastic that won’t break down because of uric acid and has a non-stick coating so you can more easily remove litter. Overall, Pet Fusion’s BetterBox is a great choice for cat owners looking for a high-quality litter box that will work well for most senior cats. What sets this litter box apart is that it fits easily into a corner, making it a great way to save on space. It also features a convenient pour spout that makes it easy to empty and an anti-microbial coating that will cut down on litter box odors. If you’re looking for the best litter box for senior cats that will save you some space, then the Nature’s Miracle Advanced Corner Litter Box could be right for you. This is a good litter box to try if you’re moving from a covered to an open box because it’s inexpensive so it won’t be a huge waste if it doesn’t work out for your cat. This litter box may not be the best for every cat, but if you have a small, neat cat that just needs a low entry point, the Van Ness CP4 Framed Litter Box could work perfectly for you. Like their corner-fitted model, this litter box is great for older cats that need a low entry point but are also messy. All in all, the Nature’s Miracle High-Sided Litter Box is a great option for anyone with an older cat who’s looking for a simple litter box they can use easily. Besides simply buying a new litter box, there are a few things that you can do for you senior cat to help them use the litter box more easily. By doing these things, you will make it easier on them and may find that they are able to use their litter box just like they always have. Although it’s common practice to only have one litter box more than the number of cats in the house, you may need to add some more litter boxes for your elderly cat. Imagine how difficult it would be if you had to run up the stairs to go to the bathroom with a leaky bladder and arthritic joints. If you don’t want to do it, then why make your cat do it? It’s especially important to have a litter box on every floor of your house when you have an older cat. Additionally, having litter boxes throughout the house will allow your mentally-impaired cat to see them often and remember they need to go. When choosing where to put litter boxes, the most important thing with elderly cats is to place them where the cat is most often. If your cat spends most of their time in the living room, then that’s where the litter box should be so they can get there as quickly as possible and without having to go far. If that doesn’t work, then consider having it in a nearby bathroom. The shorter the distance your senior feline has to travel to get to a litter box, the more likely they are to use it which will make life easier for everyone involved. Senior cats can enjoy a great quality of life and make wonderful companions. Elderly cats can be good at hiding the signs of aging – usually better that that than most humans are. That does not mean your cat isn’t changing. Keep a close eye on your cat’s needs at any stage of his or her life – even more so as they get older. Adjust their living conditions accordingly – including finding the best litter box for senior cats – and you can keep on enjoying life with your best furry friend for years to come.